Atlanta, GA (March 13, 2018) — Supernatural drama series Stranger Things returned to Netflix near the end of 2017 having introduced the world to Eleven, Mike, Will, Lucas, Dustin, Nancy, Steve, Jonathan and the adults of the fictitious town of Hawkins, Indiana through its breakout debut season. 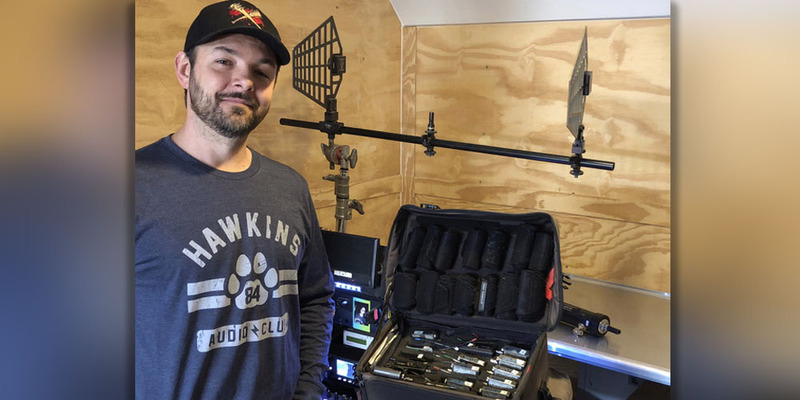 Season two also saw Michael P. Clark join the crew as the production sound mixer, accompanied by his extensive collection of Lectrosonics Digital Hybrid Wireless equipment, including SSM, SMV and SMQV beltpack transmitters and VR Field, Venue and Venue2 multichannel receivers. Stranger Things may be set in Indiana, but it’s actually filmed in Georgia. Clark, an 18-year veteran of production sound who is based in the Atlanta area, previously worked on the pilot and first season of Halt and Catch Fire — where Georgia locations stood in for Texas — and has so far racked up more than 85 episodes of The Walking Dead, both for AMC. He started his career on Good Eats, working on 185 episodes of the Food Network show beginning in January 2001. Stranger Things is a two-camera show, but treated largely as a single-camera show with setups with wide and tights, he reports, which enables the team to use booms outfitted with Lectrosonics SMQV transmitters. On scenes where the director shoots wide shots and he must wire the actors for RF, Clark can select from his collection of Lectrosonics beltpack transmitters, including two SSM, 10 SMV and seven UM400a models, paired with DPA Microphones 4060, 4061 or 4071 elements. The choice of equipment “depends on the actors, the wardrobe, volume and where we have to place the mic,” he says. On Stranger Things, much of which was shot indoors or on a stage, he planted mics around the set to supplement the booms whenever possible. “We use plants as much as we can. We don’t like to use wires on the actors if we don’t have to. Plus, we want to give post production those options. It’s great because I have all those channels available to me, so I can really plant out if I need to,” says Clark, who mixes to a 12-track recorder.